Early in the holidays, we examined the expectations of a record-breaking peak period for e-commerce during the 2015 sales season. These predictions proved to be the case as online sales soared, but not in the kind of even distribution across big brands that some analysts expected. Logistics is an extraordinary business. It touches almost every element of our personal and professional lives, yet often remains in the background for all except those of us who work in the field. Each part of the supply chain contributes in some way to bringing products into homes and businesses around the country, with a massive contribution to employment and the wider economy. 25,320 miles of navigable sailing channels. For more on where we see the profession going this year, read our summary of supply chain management trends for 2014. 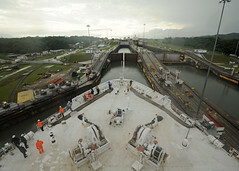 The Panama Canal has long been a crucial route for U.S. supply chains, with around 70% of all cargo moving in and out of the country passing through it every year. Next year sees the waterway’s centennial and some significant events will mark the occasion, not least of which is the targeted completion of its expanded capacity. The improvement, which has been ongoing since its approval in 2006, will double the capacity of the route and allow three times as much cargo to pass through it every year. In reality the project is likely to go into overtime, perhaps into early 2015, but the ramifications of the work are already the subject of much speculation. Logistics analysts are assessing how this is likely to change the logistics business in the U.S.
For over 60 years the Pacific coast ports have seen greater growth than their Atlantic coast peers, boosted primarily by the vast volume of imports utilizing the North America-Asia trade routes. The combination of relatively unrestricted transit conditions and efficient intermodal transport solutions from the west coast inland have proved to be a winning formula. As the Panama Canal expands to allow for increasingly large container vessels, and North America’s imports are sourced from more diverse locations around the world, growth is beginning to swing in favor of the Eastern seaboard. Rather than pit this as a good old fashioned East vs. West grudge match, however, logistics professionals around the country are likely to embrace these developments. Anyone who has spent time in the industry knows how uncomfortable it is for businesses to be heavily reliant on just one transportation route, so anything that opens up new options and redistributes the balance of goods flowing in and out of the country should be seen as a positive. A flexible supply chain allows for alternate routing, which is something that the Panama Canal will be better able to accommodate in the near future. Any major expansion in one mode of transport tends to necessitate improvements in others, meaning that the knock-on investment in transportation infrastructure provides a boost to businesses up and down the supply chain. This can already be seen in the Tri-State area with the increases in height of the Bayonne Bridge in New Jersey. Though we can expect the usual construction grumbles in the short term, the longer term efficiency improvements will be a boost to a wide range of businesses. Consumer confidence in logistics continues to grow – 15 percent in the first half of 2013. That’s great news as the U.S. economy continues to show signs that it’s bouncing back.